Be the first to share your favorite memory, photo or story of Herman. This memorial page is dedicated for family, friends and future generations to celebrate the life of their loved one. Herman J. Harper, 106 year old longtime Mooreland resident, died Friday, January 25, 2019 in Mooreland. Funeral services will be held at 2:00 p.m. Friday, February 1, 2019 at the First United Methodist Church of Mooreland with Pastor Todd Bergman officiating. Burial will follow in the Elmwood Cemetery with the United States Navy providing military graveside rites. Herman Jake Harper was born October 27, 1912 in Quinlan, Oklahoma, the third of nine children born to Ernest and Hannah (Laubach) Harper. In 1922, the family purchased a farm seven miles southeast of Mooreland. That is the home and land where Herman lived until moving into Mooreland in 2012. Herman attended school in Quinlan and Mooreland and graduated from Mooreland High School in 1932. He was drafted into the United States Navy and served as a Seabee before being honorably discharged in October of 1945. All of Hermanâ€™s six brothers served during World War II and amazingly all of them returned from war safely. Several things changed while Herman and his brothers were deployed. His two sisters were born and their mother passed away from breast cancer. But one thing remained the same, their father continued farming, hiring help while all of his sons were deployed. Herman dabbled in the carpentry business for many years, having built around five homes in Mooreland and he built the first Sonic. 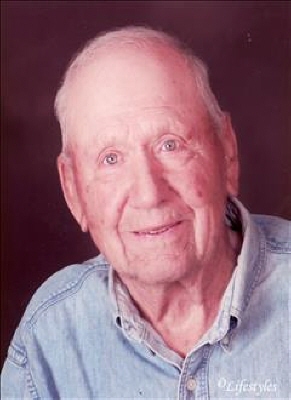 He was a cattleman and farmer prior to and after World War II. He continued farming and working cattle until a few years ago. He was baptized in the Woodward Christian Church. He is survived by nieces and nephews: Bill Harper of Woodward, Linda Horner of Woodward, Verneda Lewis of Mooreland, Roger Lewis of Paoli, Velma Pearson of Mooreland, Marie Herzer of Woodward, Bobby Lewis of McAlester, Julie Lewis of Durant, Barbara Kimes of Lakeway, Texas, Susan Kane of Bellflower, California, Mark Harper of California, and Linda Harper of Arizona; other relatives and friends. He was preceded in death by his parents, brothers and sisters, Carl, Fenton, Vernon, Virgil, Francis, Howard, Margaret, Ruth and half brother Lynn and half sister Gladiss. To send flowers or a remembrance gift to the family of Herman Harper, please visit our Tribute Store. "Email Address" would like to share the life celebration of Herman Harper. Click on the "link" to go to share a favorite memory or leave a condolence message for the family.